The window is traditionally called a “Rose” window due to its round shape and is normally found in the wall at the altar or narthex end of the building. 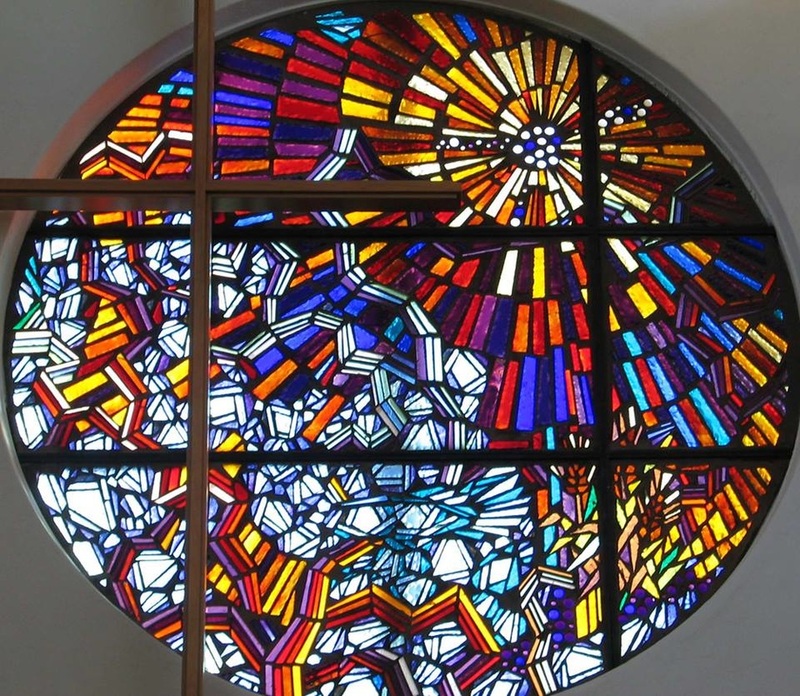 St. Mark’s Rose Window was designed by Ken Tony, an artist owner of Glass Art Studios in Scottsdale. He was asked to design a window depicting the “mystery of God overcoming the cross.” One hundred and seventy-six members of St. Mark’s had critical input during the process. The Mystery of God is represented by the sunburst. The maze-like rainbow represents our covenant relationship. In the bottom right-hand side can be found clusters of grapes and three sheaves of wheat representing the Holy Eucharist or Last Supper. In the top of the bottom center panel there is an impressionistic fish, with the tail going to the right; this represents the symbol the early Christians used to represent Christ and prearranged communications. The Greek word for fish, icthus, contains the first letters of Jesus Christ, Son of God, Savior. Contained within the window and surrounding the big wooden cross are five blood-red pieces of glass, representing the five wounds of Christ. The “Window” was given in loving memory of her husband Raymond Finn, by Elizabeth Finn, in January 1982. The window is made with faceted glass set in epoxy.